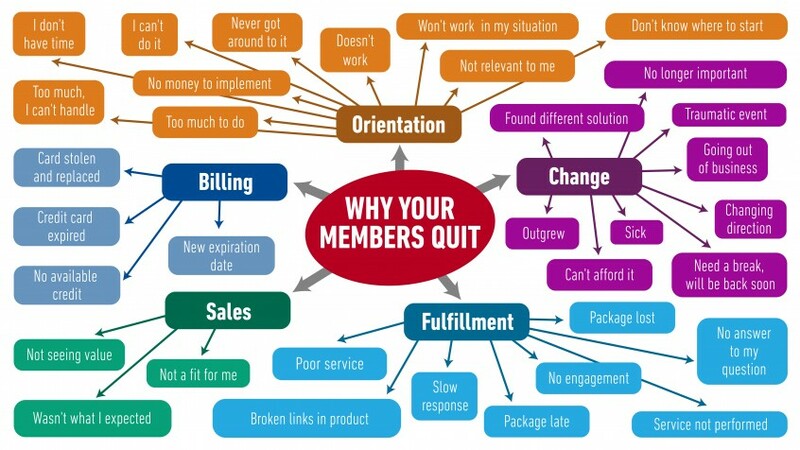 With all the reasons your members have for quitting, is it any wonder you’re able to keep your members at all? 1. Return on investment — value received in excess of their membership investment. 2. Mission — to be part of a movement that’s bigger than themselves. 3. Growth — an opportunity to contribute back to the community. 4. Recognition — applause and acclaim from a peer group they respect. 5. Connection — relationships formed with other members. When your new member joined, he was excited about solving some problem or experiencing some breakthrough. Your sales materials promoted the transformations he would undergo as a member. He had a mental picture of what life would be like as a member. Then he joined. In the minutes, hours, and days since his membership first began, his excitement has waned. It may be his expectations were wrong to begin with. It could be your performance wasn’t up to par. Or, more likely, other things have caught his attention. Some smart marketers have addressed this using an email follow-up series after someone joins their membership. Most often, these emails feature the benefits members receive and show the new member how to get started. Nice, but wrong. This is wrong because it doesn’t address the problem. Yes, you could be hearing things like “I don’t know how to access my benefits” or “I didn’t know that was included in my membership,” but you aren’t going to answer those questions with emails stuffed with facts. Instead, you need messages that address your new member’s biggest dreams. What problems did your new member join your program to solve? What were the big pain points that you addressed within your sales message that you can reinforce within your new member orientation follow-up sequence. When your member joined your membership, they had a mental picture of what life would be like when they bought your program and implemented it. The biggest reason your members quit is they’re losing sight of that picture. You’ll never stop all your members from quitting, nor do you want to. Some churn is inevitable and healthy. You can minimize unnecessary churn by keeping that mental picture in the forefront of each member’s mind after the sale and throughout the new member engagement process. I like what you’re saying here, but it seems that here is a line that would balance practical information vs big dreams stuff for new members especially. As a recent new member of IMA and GKIC, I really want to know what’s available to me, such as the email I received about the health care benefits. While not a huge part of why people join the IMA, that kind of stuff does add to the value of it. And that’s just one example. So it seems that there is a need for both types of email, especially for new members. And yes, you can present the practical stuff in ways that keep the focus on the big picture ideas that motivated them to join. Very thoughtful comment. Thank you. You definitely should include “how to” together with inspirational materials. Most membership programs over-emphasize the “how to” when members join. It’s a lot easier to buy a program than it is to do one. I can tell you I’ve bought a lot of diet books that I’ve never completed. I started to fall back into my old habits. I’d think a lot about the restaurants and the food I enjoyed. I didn’t want to change my habits. I was afraid of what people around me might say if I changed. Your new member is thinking all this and more when they consider implementing your new systems. Give them the detailed “how to” and package it together with a healthy dose of inspiration. Thank you again for the comment. It’s helpful to think this through. Do you have any suggestons for a non-profit animal rescue shelter for a newsletter that will keep consistent donations coming in? check out Happy Trails Farm Animal Sanctuary, they do a great job with their newsletter. http://www.happytrailsfarm.org.